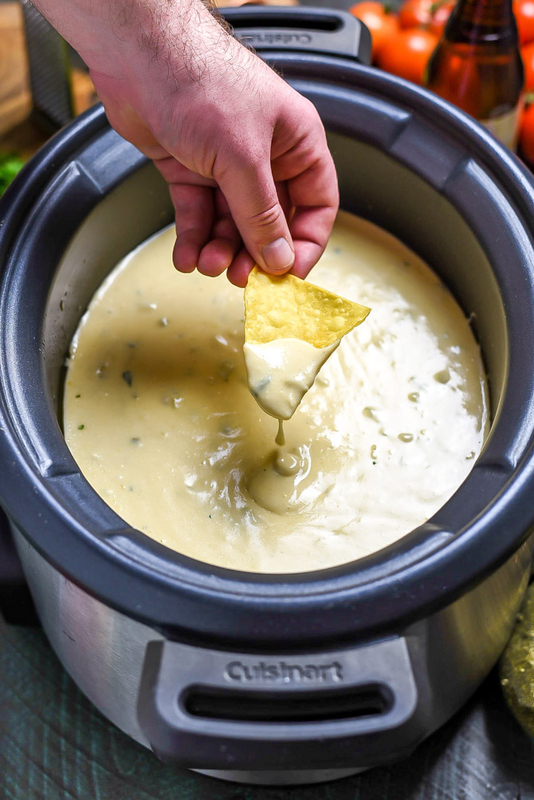 Slow Cooker Queso Blanco. This velvety, rich cheese dip is just as good– if not better– than the kind you get from your favorite Mexican restaurant. 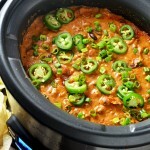 Serve it straight from the slow cooker (where it will keep warm) at a party, or ladle over nachos. Somewhere around the point of “8 pounds of cheese down”, I started to think that maybe I should cool it on the queso for the week. Alright, that’s a bit of an exaggeration, but it really feels like I have eaten enough gallons of cheese dip to sustain a small village over the past few days. The thing is, I’ve been making queso in the slow cooker for years now, but I’ve always somewhat winged it with different cheeses, different cooking times, and different mix-ins. 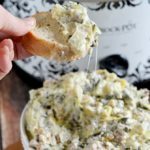 I never bothered to measure and tweak to perfection, until one of my friends mentioned that she’d been preparing her menu for her upcoming Super Bowl party, and asked me if I had a recipe on the blog for “that crock pot cheese dip”. No, but I should. I really should. 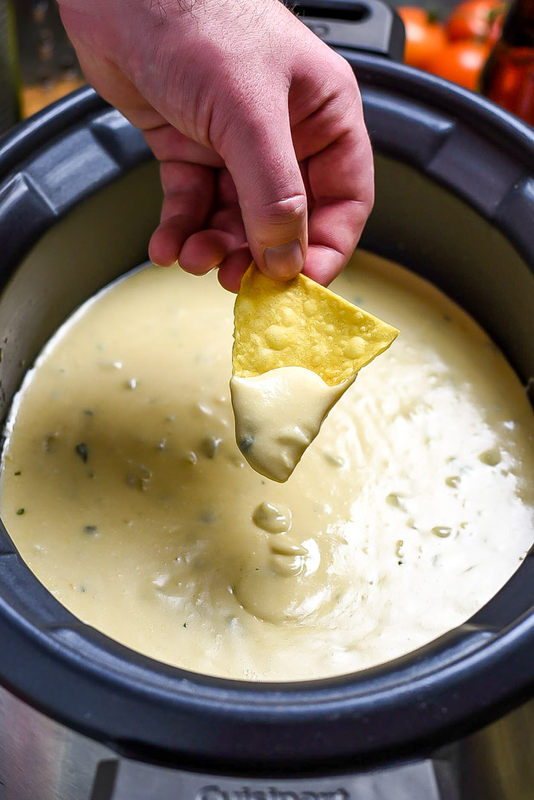 So, long story short, after a lot of testing, I’ve found my favorite form of that crock pot cheese dip: this Slow Cooker Queso Blanco. And after all of that testing, I obviously couldn’t let any go to waste. (It should be a crime to even consider it!) I still have a couple of cups’ worth of queso in my fridge, by the way. You know, just in case anyone wants to come eat it and save me from myself. People have been making queso with Velveeta for longer than I’ve been alive, and I won’t deny that it serves its purpose. But for as useful as the bright orange cheese-substitute is, it’s also just not cheese. Or at least not real cheese– it’s pasteurized cheese product, which tastes as strangely off as it sounds. (Mind you, not all pasteurized cheese products are bad. But we’ll get back to that in a minute.) Personally, I try to avoid it, and it especially has no place in Queso Blanco (aka white cheese sauce), as it’s… well… orange. And it’s also decidedly not delicious. Instead, I use a trick that I picked up from J. Kenji Lopez-Alt of The Food Lab, which is using shredded cheese, evaporated milk, and cornstarch to make a smooth sauce. Kenji tosses his cheeses in cornstarch, adds them to a pot of warm evaporated milk, and stirs until the cheeses are fully melted and combined. (I also now use this method for many of my own recipes.) The cornstarch prevents clumping and helps to thicken the liquid, while the evaporated milk contains a denser concentration of milk proteins than regular milk, which also ensures that the sauce is smooth and stable. Generally, when making cheese sauce with Kenji’s method, I reach for a mixture of cheddars. However, I really love the consistency of white cheese sauce, which is made smoother with the help of a different (but much more appealingly-flavored) processed cheese– American cheese. I know, you think I’m a hypocrite after rambling on about the virtues of real cheese, but don’t let me lose you here. I’m not generally an American cheese fan myself… At least not on its own. But deli-sliced white American cheeses are leaps and bounds more delicious than their single-slice-packaged-counterparts, and they contain less chemicals and additives and more actual cheese. 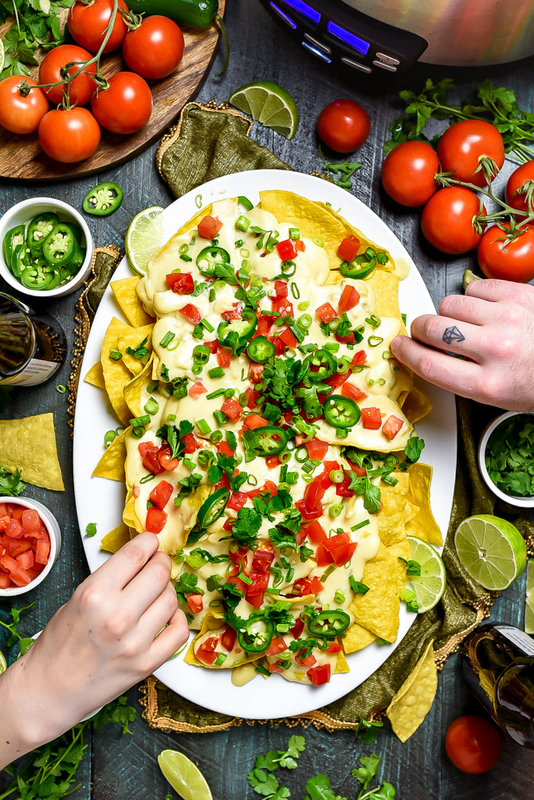 Meanwhile, they still have added ingredients that help give them a smoother, more stable melt, and the creamy flavor is exactly what you want in a good queso dip. 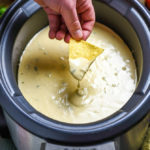 Not to worry though, we also use real real cheese in the form of Monterrey Jack for this Slow Cooker Queso Blanco recipe, which has a mild flavor similar to cheddar cheese, but is great for melting and is often used in Mexican and Tex-Mex restaurants here in the states (like the ones you’re likely usually eating queso blanco at). Just like with Kenji’s method, I toss the cheeses with cornstarch before adding them to the slow cooker. I don’t heat the evaporated milk first, though. Instead, I pour the evaporated milk into the slow cooker and heat it all together over low heat for 90 minutes. But before I do that, I like to add a little extra flavor to the mix. My favorite way to do so is with chiles. I use both milder diced green chiles (from a can) and fresh, spicy minced jalapenos to add plenty of flavor. In addition, I mix in garlic powder, onion powder, cumin, and salt. 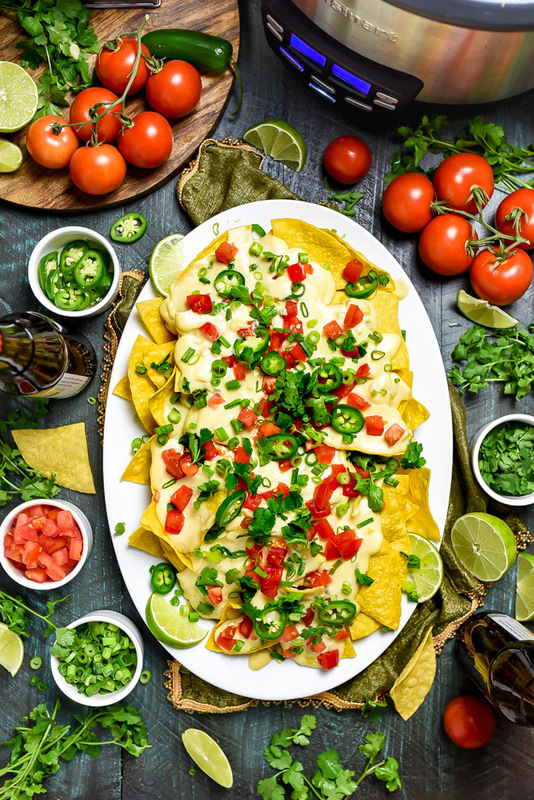 You can use fresh garlic and onion if desired, but at that point I feel like the cheese dip gets a little too chunky for my tastes– the chiles as enough texture to the otherwise smooth sauce as it is. After everything is heated through, I stir it all until smooth. 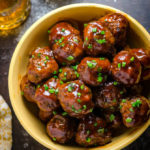 At first it’s going to look a bit concerning– slightly grainy, thin, and not entirely melted, but as you stir it will come together to form a thick, beautiful, shiny, smooth sauce that’s absolutely perfect for dipping. If I don’t have enough evaporated milk, can I cut it with some half and half or whipping cream for the same result? Let me raise my hand and volunteer to be a taste tester for you– it looks like a lot of cheese went into recipe development! Looks delicious! 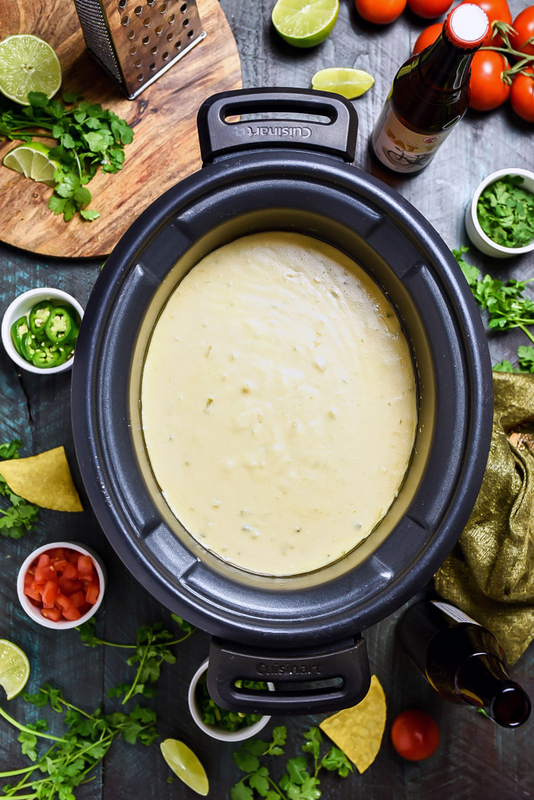 You can’t go wrong with queso blanco and this slow cooker recipe looks like the perfect thing to serve at our next gathering. 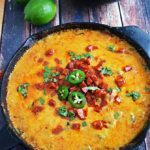 This is an amazing cheese dip! a must have at any party or gathering! a huge hit with my guests! This is one of my favorite indulgences when I eat out- so good on top of chips, tacos, and so much more. 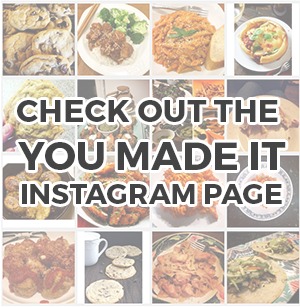 Thanks for the delicious recipe- and beautiful photos! I’m not sure what happened but grainy is an understatement! I cut the recipe in half which I measured and weighed to make sure I had it correct. I’ve made plenty of queso and never have I had something come out so terrible! It even lacked in flavor so in the end when I served the gritty mess I stirred in seasoned steak, black beans, and a tiny bit of rotel which helped the flavor but gosh this was disappointing! I feel like the cornstarch move didn’t allow the cheese to melt properly you could see pieces that just didn’t melt! And freshly grated cheese should melt perfectly. I’m sorry to hear that, Tiffany. I doubt halving the recipe impacted the final product, but I think that maybe it wasn’t stirred long enough to fully melt and combine the cheeses– it does take a few solid minutes of stirring in order to fully melt and combine. Was it also very thin? If so, I’d think that that was probably the case. I’m sorry again that you didn’t have a good experience with it and thank you for the feedback.